Timberline Resort is located high up along the higher range of the Alleghany Mountains in West Virginia. With its 4268-foot summit, you are sure to find beautiful snow and fantastic views of the valley floor and surroundings. Timberline is well known for its wide slopes and varied terrain, but it is also home to the southeast’s longest ski slope – Salamander – an easy two-mile green trail winding down the mountain. Intermediate skiers will find wide blue ski trails with crazy vista points that will provide great photo opportunities. Adventurous and advanced skiers will really enjoy the laid-back mountain attitude and dedicated tree skiing (more than 5 glades are open when conditions allow). All of Timberline’s main slopes offer a 1000-foot vertical drop. More snow making equipment, more glade skiing, a new deck with a view to the terrain park, upgrades to Timbers Inn, their slope side hotel. Alpine skiing, Snowboarding, Telemark Skiing, Cross Country, Adaptive programs… you name it… Timberline’s ski school is truly dedicated to offer beginner and advanced skiers the means to improve their skills. You’ll quickly notice that nearly all their instructors carry more than one certification from PSIA and/or AASI, and that their continuing education is something they like to “brag about”. 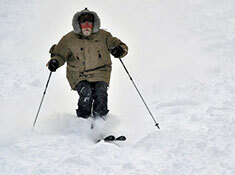 Several of their instructors have more than 30 years teaching on the snow. Their kids program will always impress, and set the little ones up for success with so much fun! Timberline has the only slopeside hotel in the valley. What are you waiting for? Ski In, Ski Out… dare not to ski off your balcony! Timberline offers a convenient way to access some great backcountry. Give them a call to ensure conditions are optimal, and then take your backcountry gear to the lift. You can easily access places such as the Dolly Sods Wilderness Area faster and safer than you could drive there. No other places will put you closer to the wild – nowhere in West Virginia. Welcome to Timberline – you’ll find numerous choices for slopeside lodging, secluded homes, lakefront access, and even condo & townhomes that won’t “break the bank”. Timberline Realty is the only realty company in the area that is associated with Timberline Resort – so you’ll have over 150 lodging possibilities to choose from, right at your fingertips.